Lemongrass is a casually chic restaurant open for lunch and even late-night dinners, which offers a Thai-based fusion of Asian flavors. 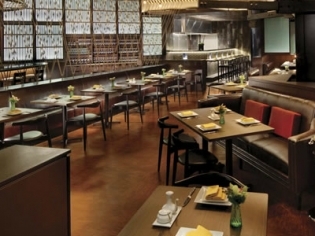 From conventional to contemporary, take a mouth-watering tour of Thai cuisine. This casually chic restaurant, which is open for lunch and even late-night dinners, offers a Thai-based fusion of Asian flavors. The satay bar lines the dining room and offers charcoal-grilled meats and seafood with a variety of sauces and seasonings. Known for Lemongrass prawns and salmon spring rolls, the restaurant also offers curries, salads and soups. The seasonings are imported from Chef Krairavee’s home of Bangkok, imparting a perfect rendition of traditional favorites and updated modern creations. Try the restaurant’s signature beverage, Lemongrass Iced Tea, or indulge in a Thai beer or specially selected wine. The decor is a feast for the eyes with its minimalist hangings of rope and silk from high ceilings with back-lit Asian wooden screens as bar back drops. The dark woods and leather banquettes make for a classy, romantic atmosphere. There are two private dining rooms for a more exclusive experience. The food is good. The service is good. I loved it. Have gone a few times. Will go again. Spare yourself and don’t eat here. Went a group of eight people and half of the group ordered pho and they had to send their pho back because it tasted like medicine/cough syrup. Not okay when the price tag was so high.